There’s an advanced feature in the Squeeze Page Toolkit that isn’t overtly promoted, which can be really useful to you if you want to use 1 squeeze page, but you want to send people to your squeeze page from different sources whilst tracking where they came from. When somebody signs up, the source information is added to their record in MailChimp. This means you can track within MailChimp where somebody came from. Although the source not automatic (you have to tell the landing page what data to track), it’s still very powerful. And then you use this, to create the personalised links for each affiliate. e.g. Now this is an advanced technique. So only use it if you’re very comfortable with MailChimp and the toolkit. Traffic Testing – where you’re tracking if someone signs up via your blog, or twitter, or Facebook, etc. This method works with most CRMs, but this example shows how it works with MailChimp. 1.) 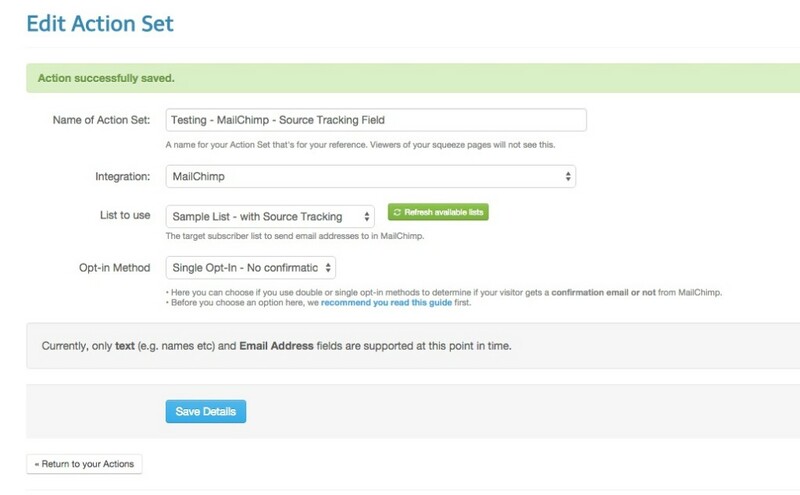 In MailChimp we need to add the ‘Source’ tracking field. So go to “Settings” and then “List fields and *|MERGE|* tags” when viewing details of your target list (where subscribers will go when then sign up). 2.) You should then see that you have an Email Address field, a First Name, and Last Name Field. These are what MailChip creates by default. Now we need to click on the button that says “Add A Field”. This is how we’re going to add our new Source field. 3.) Now we need to select a simple ‘Text‘ field. This is all that we want to add. If you add any other type, then this will not work correctly. 4.) The new field now appears, and it’s called Untitled and has a tag called MMERGE3. We’ll change both of these in the next step. 5.) We need to rename ‘Untitled‘ to ‘Source‘, and ‘MMERGE3‘ to ‘SOURCE‘. We also need to ensure that the ‘Visible?’ and ‘Required‘ boxes are both unticked. This is extremely important!! (If this step isn’t correct, then the squeeze page will not work correctly). Once you’ve made the changes, click on ‘Save Changes‘. 6.) In the Squeeze Page Toolkit , create a normal ActionSet that links to the list that you’ve got. (If you’ve already created the ActionSet for this list, you don’t need to do it again). 7.) In the Squeeze Page Toolkit page editor, create a squeeze page as usual with an opt-in form. (You can also use the popup opt-in form if you prefer). Select the ActionSet as usual. You might want to click on the green button ‘Reload Opt-in Form‘ to load the new hidden source field. Save the page changes, and go back to ‘Your Pages’ to view the live page (by clicking on the ‘Use Page‘ button). If you copy that URL into a new web browser tab, and then fill in your details, you should see (in a few minutes) within MailChimp your email address, along with the value you used for ‘SOURCE‘. You can put whatever you like after SOURCE= (as long as there aren’t any spaces). So create as many URLs as you wish, with different values for ‘SOURCE‘ for each place or person you’re giving a URL to. MailChimp only allows an email address to appear once in a list. So if you keep testing with the same email address, you’ll see an error on the page saying that the email address already exists. Either use several different email addresses, or delete your email from the list before testing again.